After weeks and weeks of waiting, my HLHB system finally caught a very convincing signal yesterday! As you can see from the chart I uploaded, there was a bullish crossover yesterday, sometime around 6:00 am EDT (or 12:00 noon GMT). 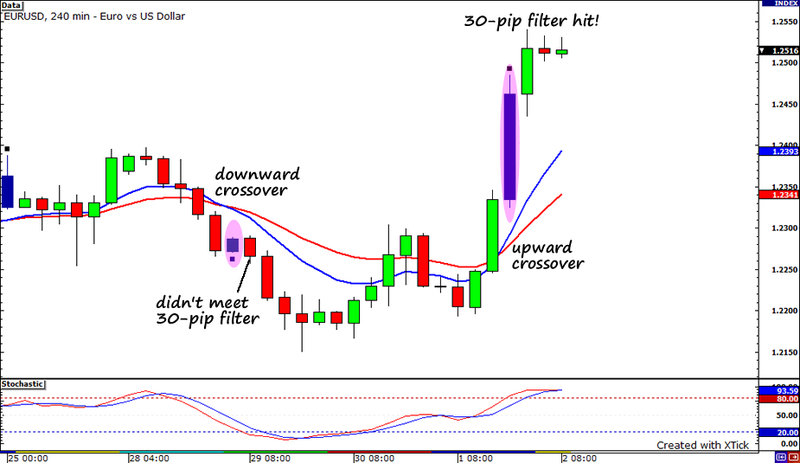 With stochastics not yet at overbought territory, I could enter long if the next candle goes beyond 30 pips the high of the crossover candle. Price eventually did, and I was able to buy at 1.2515. It’s still too early to tell whether the trade will pan out like I want to, but I am very hopeful. The dollar took a beating yesterday, as it got trampled on by all those risk hungry traders. Where did this sudden drop in dollar demand come from? Could it be from all the poor data we’ve been seeing recently? But, but, but… didn’t we just see the dollar gain earlier this week when all the hubbaloo from China came out that sparked risk aversion? I just don’t get it. What’s really driving the market right now? Is it economic data? Or was yesterday just one of those days? Once again, I am left dumbfounded by what’s happening. And I guess this is just natural. I am after all, still a noob. Its barely been just about 6 months since I’ve entered the world of forex and boy, so much has happened in the past half year. I do believe that there’s so much to learn and I need to keep chugging along! That’s all for this week! Time to enjoy the Fourth of July weekend! I just love this holiday – the barbeques, the family bonding and most importantly… the chance to see Jac-abs! I mean, Jacob, Edward, and Bella light up the cinema screens! Eclipse just broke the single day opening record! Let’s see how it does this weekend! Time to take a break, forget the markets and enjoy. You should too! Have a great weekend folks!